ArtiCulture’s Fall Classes & New Facebook Page! October marks the start of ArtiCulture’s Fall session of art classes and workshops for all ages, from 1 to 100. Topics include Art Sprouts for Toddlers, Edible Holiday House, Comics to Animation, Drawing & Painting, Paper & Book Arts, Fused Glass Jewelry, and much more. They also offer a variety of art camps for school age children during school release days and winter break. Click on the link to see the complete Fall Schedule. If you’re interested in volunteering, check out the new ArtiCulture Volunteers Facebook group. Hennepin County and the City of Minneapolis are planning for the repaving of Franklin Avenue (County Road 5) between 16th Ave and 21st Ave in 2016. In conjunction with this repaving project, they will be working to improve the difficult, high-traffic and dangerous Franklin/Cedar/Minnehaha intersection. Anticipated changes include the closure of Minnehaha Avenue north of Franklin; removing the traffic signal at Franklin & Minnehaha; creating a southbound turn lane from Cedar to 22nd Street; and improving the bike lanes and crosswalks. City and County planners have been getting feedback from the public and meeting with stakeholders, and will hold a public open house some time in November. The best way to stay in the loop about this project is to visit the County’s Project Webpage and sign up for project updates via email. The City has been reconstructing and repaving this stretch of Minnehaha Avenue for the past few months and is expected to be completed this fall. For more information, visit the City’s Minnehaha Ave Paving webpage. Just around the corner is the reconstruction of Snelling Avenue from 22nd to 24th Streets. The City began work this summer installing storm sewers near 24th & Snelling. The reconstruction of this stretch of Snelling will occur in 2016, when crews will dig up the road, install new curbs and gutters, and repave. 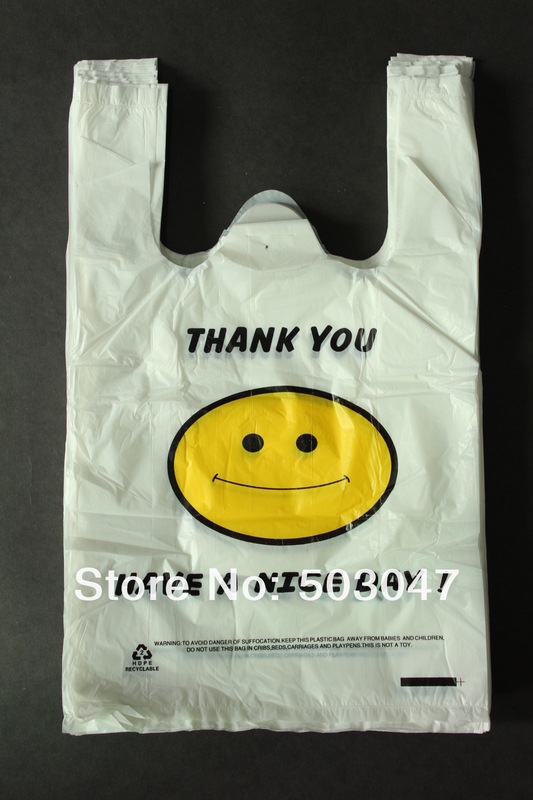 For more information, visit the City’s 24th St & Snelling Ave webpage. 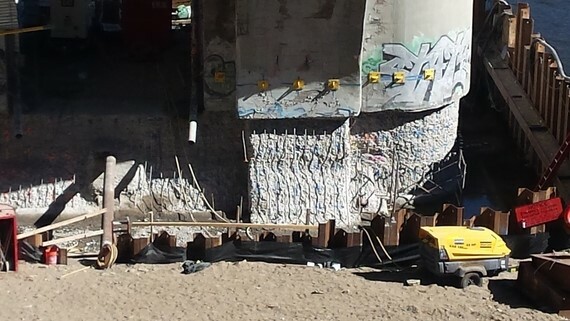 Crews continue their work to restore concrete below the bridge deck, including work on the piers. Below is a picture of a section of pier that has been restored using shotcrete. Shotcrete is a special concrete that is applied using a controlled spray. Sprayed concrete – shotcrete – used to repair pier below bridge deck. Crews have also been using the cofferdams in the river to get access to the parts of the pier that are at and below river level. 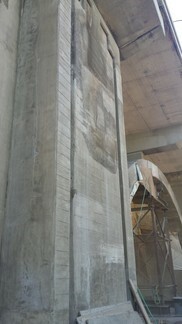 Below is a picture showing concrete removal at one of the piers. Concrete is being restored in a way that protects the integrity of the structures. Repair of pier below river level. Crews continue to work at the casting yard at Bohemian Flats area up the river to create the roadway deck panels. At present, more than 160 of the 366 panels needed for the roadway deck have been completed. All panels will be floated down the river next year and hoisted into place. For more information and to sign up for email updates visit the County’s Franklin Ave Bridge webpage. Please direct any questions or comments to franklinbridge@hennepin.us. The Minnesota Clean Energy Resource Teams (CERTs) seeks proposals for seed grant funds. These grants are designed to provide limited financial assistance for energy efficiency and/or renewable energy projects. Project funding can support assistance services (labor costs only, such as for a consultant, design professional, installer, or student labor), for projects in all seven MN CERT regions. Past projects can be seen at http://mncerts.org/projects, and case studies can be read at http://mncerts.org/casestudies. The deadline to apply is Monday, October 26th, 2015 at 4:00pm. To learn more, visit http://mncerts.org/rfp.